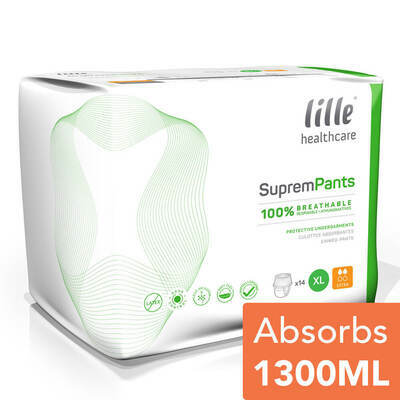 These Lille Pull Up Pants Suprem XLarge Extra 14 are suitable for dealing with varied levels of incontinence for active individuals. Designed to offer practicality, they can be slipped on in a similar manner to underwear with weak sides that can be torn once soiled. The carefully crafted shape has been anatomically designed to offer the same security but with heightened breathability and gentle on the skin. A narrow and contoured crotch features more Lycra for a closer fit with a wetness indicator that highlights when they need to be changed. There is also an adhesive strip at the back of the product, allowing the pull up pants to be rolled up before disposal.